RS Components has introduced the Fluke 710mA Loop Valve Tester, which is an easy-to-use tool that greatly simplifies the testing of control valves, enabling the quick measurement of critical valve readings using a simple two-wire connection. The device provides quick checks of control valves while they are in place in a system. It sources the 4-20mA current loop signal and causes the smart control valve to move, while simultaneously interrogating the HART communication protocol data to collect critical diagnostic information about the valve’s position and status. Therefore, the tester enables technicians to make fast and confident decisions on whether maintenance and potentially system downtime, is required or not. The built-in pre-configured valve-test routines provided by the device comprise manually changing the mA signal and viewing the HART position and pressure variable information; full range ramping of the signal while recording the position or applied pressures, in terms of percentage from 0 to 100 to 0%; evaluating the valve’s response to changes in the mA input; speed tests to determine how fast the valve can open or close; and bump and partial stroke tests to test valves over a portion of their range. 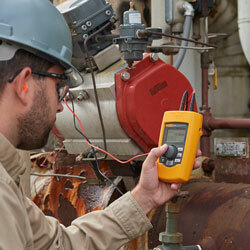 Measurements and other test results are recorded and stored in the device’s memory, where they can be uploaded to the Fluke ValveTrack analysis software, which is incorporated with the tester. This allows technicians to plot logged valve tests taken in the field, as well as the capacity to compare past uploaded tests to recent tests.